Newly Upgraded Two-Bedroom in Miami Township! Save $1200 Today! Live, Work, Play – Schedule a Tour Today! Located directly across from LexisNexis in Miami Township, these apartments in Centerville Ohio offer immediate access to major Dayton employers, I-675 and I-75, trendy retail, dining, and entertainment venues in the Centerville area. Click below to read and learn more! As a nurse I work what feels like constantly. The quick commute from the hospital to my apartment in Centerville Ohio is a lifesaver. When I get a moment to myself it’s so important that I have a comfortable place to relax and read a book. For me, the smell of my home is one of the most important elements. I use essential oil diffusers in my space so when I come home after 12 hours in the hospital my nose can tell I’m home. I like to use lavender and chamomile, relax with a nice cup of tea and a book, and put my tired feet up. Your pets are welcome here! Stroll tree-lined sidewalks with your furry friends. Online rent payments are processed by First Billing Services. New residents can sign up for an account at FirstPay. If you have any questions, please call First Billing at 877-436-2798 or email customerservice@firstbillingservices.com. Residents can also make payments, review payment history and make service requests via the Apartment Assistant mobile app. Download the app from the Apple App Store or Google Play, then sign in using your existing First Payment account. Save time and money with First Billing’s online payment system. Use the secure online payments page to make payments fast, easy and on your schedule. For faster service, submit a service request via the Apartment Assistant mobile app. You can also contact the front office directly during business hours at 937-396-7910. If you have a maintenance emergency, please call the emergency line 24 hours a day at 513-338-8364. If prompted, leave a voicemail with your name, telephone number, building and apartment number; a service technician will respond right away. Imagine the convenience of living within a short drive of Austin Landing and some of South Dayton’s top employers. To take advantage of these conveniently located apartments in Centerville, call today and schedule a tour. This offer won’t last forever! I've been living here for a few months now and I love it. I have had bad experiences with previous apartment complexes but here, If I ever have an issue it is taken care of as soon as they can. The staff is open, honest and very friendly. I've lived in a few apartments over the years and the maintenance here is the quickest and helpful! They care about the problem and make sure it is done the right way. I would recommend living here to anyone. Its been two years of my stay at Hunters Chase. Apartment community has been upgraded and modernized after the new management took over. Staff is very helpful and friendly to work with and maintenance service has been improved. I would definitely recommend it to anyone who is planning to move in this locality. Its been a wonderful experience for me so far...!! I am very happy with the location and the layout of the apartment. The staff is really friendly and helpful. Whenever I have had an issue or concern they have resolved the issue right away. I downsized owning my own home and I feel just at home here as I did in the home that I owned. The people at the front desk are really sweet and understanding, and the apartments are very comfortable and well kept when you move in. Plus it's close to Georgia Tech and right next to the Savannah College of Art and Design in Atlanta, allowing me to live comfortably and enjoy my time as a SCAD student. This pet-friendly community offers upgraded one- and two-bedroom layouts featuring spacious floor plans and updated kitchens with stainless steel appliances. Take a look at our floor plans. The amenities at Hunters Chase include a modern clubhouse, 24/7 state-of-the-art fitness center and yoga studio, leisure pool with sundeck and grill stations, lighted tennis courts and two fully-stocked catch-and-release fishing lakes. Learn more about our amenities. 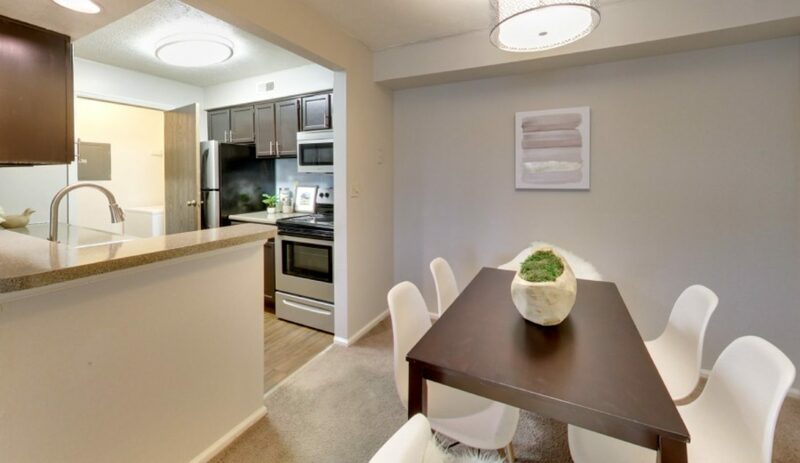 These luxurious apartments in Centerville are located within a five-mile radius of MetLife, Southview Hospital, Miami Valley Hospital South campus, PNC Mortgage, Teradata, and Merrill Lynch, making it a comfortable commute to the office. If you need to be close to Wright-Patterson Air Force Base, Wright State University, Centerville’s award-winning schools, or the University of Dayton, then Hunters Chase is the perfect community for you, your career, and your family. Here at Hunters Chase, a beautiful community of apartments in Centerville, we like to play as hard as we work. You can get your shopping done at The Greene and Austin Landing, enjoy the city with quick access to Downtown Dayton, get outside at Cox Arboretum, and shop local goods at Dorothy Lane Market. We’re also in tune with the booming craft beer industry with the following breweries in close proximity: Lock 27, Crooked Handle, Heavier Than Air, and Eudora.